Whenever travelling, I take the opportunity to visit marine rescue facilities to network with these organisations and you never know what you might learn from like minded people. 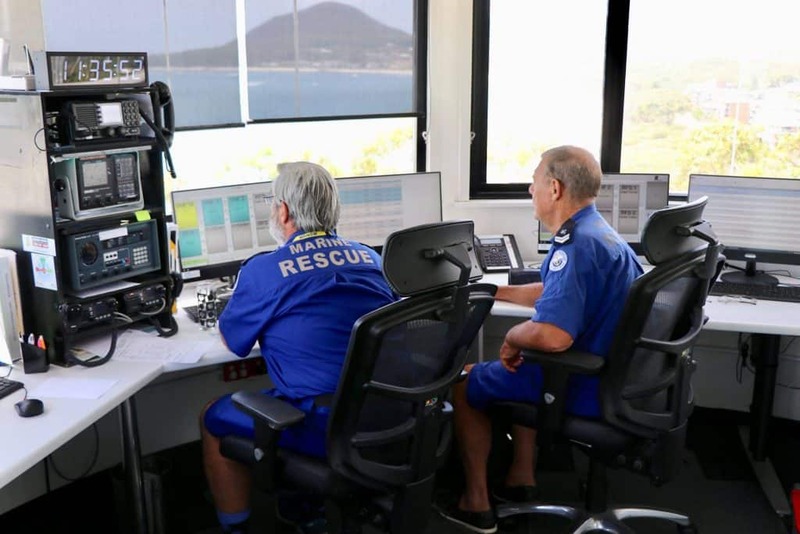 So, while in NSW, I took the opportunity to call in to visit Marine Rescue Port Stephens, positioned on prime real estate overlooking a magnificent entrance to the ocean. To increase marine safety even further here, there is a MarineRescue App available for boaters. This not only enables you to Log On by text anywhere on NSW waters ( ACRM Base actually provides this service for us down south on 0466724233 ) but also provides info on local tide, weather, sea conditions, lat/long coordinates, boat ramp locations and emergency call procedures. There was actually another reason why I wanted to check out this organisation, which did not exist back in 1973, when the seed for Sea Soaring Marine was planted. My grandmother used to lived in Nelson Bay, with dad and I often visiting this popular boat fishing location. I have previously written an article about the night my dad and I went on a boat fishing trip, with the first two lines of the poem he wrote afterwards forever quoted at family gatherings. “On a Good Friday night, without setting a light, Jack and Wayne went a boating. But if only they knew, in moment or two, both of them would be floating”. This was no laughing matter, as our small dinghy capsized, in a huge expanse of water, on our way out to sea, when miraculously a moored large vessel rescued us. So I revisited our launch location and then from the vantage point of the Marine Rescue facility, it was immediately obvious just how dangerous these waters can be for the unprepared skipper. Fortunately, there are now marine rescue groups throughout Australia on call to assist, but in the first instance we must all take responsibility for our own safety on the water.